Bombairiya Review - Checkout Movie Review of Bombairiya starring Radhika Apte, Siddhanth Kapoor, Akshay Oberoi by top critics. The movie is directed by Pia Sukanya and it released in India on 25th January 2019. Disparate dwellers of Mumbai, at various critical junctures of their lives, thrown together by circumstances and becoming determinants in each others lives and destinies. This kind of multiple stories device has been used time and again in cinema to great effect. Bombairiya, however, is a call to give it a long, if not permanent, rest in Bollywood. Its use in the film feels entirely needless; to appear smart and slick but actually doing nothing more than unleashing uncalled-for chaos in the name of cool cinema. Meghna Shergill (Radhika Apte), is a PR professional working for maverick superstar Karan Kapoor (Ravi Kishan). Her phone gets snatched by a delivery boy (Siddhanth Kapoor), when they get involved in a traffic accident. She borrows the phone of a helpful stranger Pintu (Akshay Oberoi), to sort things out on the work front and to get her phone back. Meanwhile, an encounter specialist working undercover (Amit Sial) is targeting people under instructions from jailed politician Pandya (Adil Hussain). The story set, ofcourse in Bombay, revolves around multiple people who get connected with each other because of one accident. Meghna (Radhika Apte) is a PR who is trying to adapt the spiritual life of Brahma Kumaris. She's seen burning the standee of Karan Kapoor (Ravi Kishan), who's a very famous film star. She gets into an accident with a scooty driver (Siddhanth Kapoor) who grabs her phone and ride away because she was shooting his video. 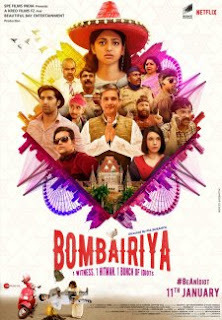 Bombairiya is set during one day in Mumbai, which begins with a misfit in a religious group bolting from a gathering and arriving on a beach, where she is trying to burn a larger-than-life cut-out. Minutes later, the rickshaw Meghna (Radhika Apte) is riding in has an accident with a scooter. An innocent bystander intervenes and gets thwacked on the head with a pink helmet. The scooter driver bolts from the scene of the crime, grabbing Meghna's mobile in order to obliterate the video evidence she filmed of his actions. When a film opens with several disparate strands all going in different directions at the same time, we expect that it will join the dots at some stage. And if it is the zany caper it's meant to be, the film will meet you halfway, never spoon-feeding you, but letting out dribs of smartly executed information till the jigsaw is all done. Mumbai is a city with "the steepest property rates and the highest number of idiots", according to the writers of Pia Sukanya's debut feature Bombairiya. Some of these exemplars of low intelligence appear to have found their way into the production, which wants to be cool and cult but doesn't work hard enough to enough to earn either label. Set in Mumbai, the film traces a crazy day in the life of Meghna (Radhika Apte), a Public Relations manager. An unlikely incident makes her run into two strangers (Akshay Oberoi and Siddhant Kapoor). Under mysterious circumstances, the three must stick around for each other. What makes them do this, forms the story. For a movie that gallops at a fair clip, first-time director Pia Sukanya's Bombairiya is extraordinarily inert. It strives for deadpan humour but falls way short, leaving the audience at the receiving end of a tedious, scrappy, patience-trying guessing game. Bombairiya has bomb written all over it.One of its principal props, among other daft diversions, is indeed a parcel bomb.